An important part of maintaining your vehicle properly is replacing your air, fuel, and cabin filters. Various filters will need to be replaced throughout the year and the mechanics at Ron’s Auto and RV of Vancouver and Battle Ground Washington can assist you when assessing filter replacement maintenance. People often wonder how often they should change their air filters. That all depends on the type of filter you have and the type of roads you drive on. If you often drive back roads with a lot of dirt and gravel you may have to change your air filter more often than the average city driver. The important thing is to have it changed before the dirt restricts air flow. Keeping up on your air filter replacement will prevent dirt and debris from getting to your engine, improve gas mileage and maintain optimal performance, therefore saving you money in the long run. Cabin filter replacements keep the inside of your ride as clean as possible. Removing contaminates like pollen, bacteria, gas exhaust and dust from the air, your cabin filter works hard at keeping your car’s interior air clean. If the filter gets too clogged with dirt and debris without being replaced it will affect the purity of the air in your vehicle’s cabin. When high allergen seasons near, it’s a good idea to have your cabin filter checked and replaced. 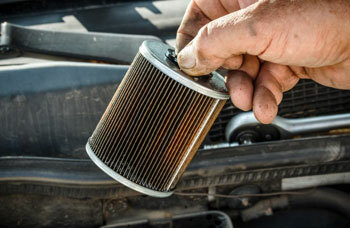 A fuel filter that is very dirty and long due a replacement can affect your engine’s performance. It can cause the engine to misfire or even stop all together. Here at Ron’s Auto and RV of Vancouver and Battle Ground Washington recommend having the fuel filter changed yearly on most cars. 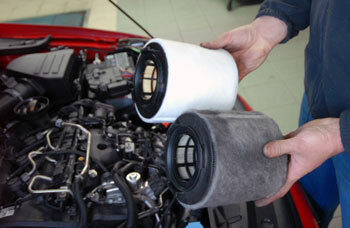 Give us a call to discuss the specifics of your car and to determine when you’ll be due for a filter replacement.